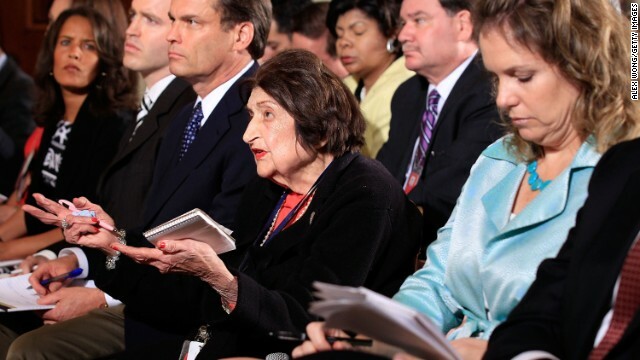 Helen Thomas, the pioneering Washington journalist whose crusading spirit made her a legend and a lightning rod, has died at age 92. She was being treated for kidney disease. Thomas’s career covering American politics spanned seven decades, and her long tenure reporting from the White House press room for the UPI wire service brought her face to face with, and often into conflict with, nine presidents, from John F. Kennedy Jr., to Barack Obama. She was famed in journalistic circles for her refusal to be awed by the power of the presidency, asking forthright -- some would say rude -- questions of the sort commanders of chief are seldom called upon to answer. Some of her questions seemed to come pre-loaded with judgment, like one that all but accused the second President Bush of having decided to go to war in Iraq even before taking office. That editorializing streak found more direct expression in the twilight of her career, when she took up writing opinion columns. Thomas showed the same lack of deference to the all-male establishment that ruled the journalism world she grew up in. Her first jobs came courtesy of World War II, when the draft of all eligible men enabled women to enter professions that had previously been closed to them. With a foot in the door, Thomas made it her mission to prop it open for other women, leading a long and ultimately successful campaign to open the elite National Press Club to female membership. Thomas would later crown that achievement by serving as the club’s first female president, one of a slew of firsts to her credit. She grew up in Kentucky and Detroit as one of nine children born to parents who immigrated from Lebanon. Thomas's Arab descent and her unflinching coverage of the Israeli-Palestinian conflict fueled persistent accusations of an anti-Israel bias. Those suspicions appeared vindicated when, in 2010, she was videotaped calling for Jews to remove themselves from Israel and "go back to Poland" and the other places in Eastern Europe their ancestors had emigrated -- or fled -- from. That rant was the end of her career, forcing her to retire from Hearst Newspapers in the face of a surge of condemnation. It was a sad way to punctuate an otherwise proud career, but with the passage of time, it's no doubt her many achievements for which she'll be remembered.